Anthony, 70, was first elected to the Oklahoma Corporation Commission in 1988. Bingman, 64, served in the Oklahoma Senate from 2006 to 2016, vacating the leadership position of pro tempore owing to term limits. He answered questions Tuesday evening at City Presbyterian Church as part of a debate night co-hosted by NonDoc. Democratic Corporation Commission candidates Ashley Nicole McCray and Blake Cummings debated first, with Bingman’s remarks following. A former mayor of Sapulpa, Bingman said Tuesday night that he has also spent 40 years in the oil and gas industry. Bingman received 38.4 percent of the popular vote to Anthony’s 47.1 in the June primary election. Tuesday, Bingman said the Corporation Commission needs updated technology and increased efficiencies for the sake of Oklahoma businesses and consumers. Bingman responded to questions about the Corporation Commission’s handling of the proposed Wind Catcher project, which would have invested billions of dollars to build the nation’s second-largest wind power energy facility in Oklahoma’s panhandle. 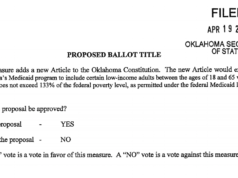 The project’s proposer, Public Service Company of Oklahoma, withdrew its framework after an adverse ruling by Texas regulators. Bingman did not specify whether he supported Wind Catcher, saying he was not in the courtroom and could not make an informed decision. Answering a half-dozen questions from journalists who initially joked about whether Anthony’s photo would like to chime in, Bingman discussed the number of earthquakes in Oklahoma, saying the Corporation Commission needed more geological data to find wells responsible for earthquakes. Bingman defended his ties to the oil and gas industry, saying his experience will aid him in making informed decisions. Like his Democratic counterparts who debated earlier Tuesday evening, Bingman supports expanding the number of corporation commissioners from three to at least five. He noted that quorum rules under Oklahoma’s Open Meetings Act prevent the three members of the commission from talking to each other outside public meetings, something he called problematic. Tuesday night’s debates were held with non-partisan partners Let’s Fix This and Generation Citizen, and they were sponsored by McSpadden Milner & Robinson, OG&E, OK Wind Power, Oklahoma Independent Petroleum Association and the Oklahoma Oil & Gas Association. Bingman arrived as the evening began, watching Democratic corporation commissioner candidates Ashley Nicole McCray and Blake Cummings debate before him. Both McCray and Cummings stayed for Bingman’s portion of the evening as well.